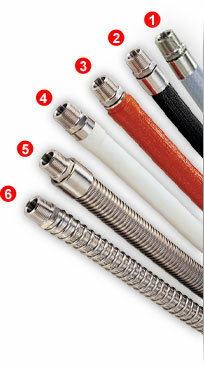 SmoothFlex™ is a flexible smooth bore PTFE hose with stainless steel braid reinforcement that is designed for long trouble-free service in a wide range of applications that may involve pressure, temperature and chemical extremes. The hose is available in virgin PTFE for high purity applications and anti-static conductive black PTFE where electrostatic dissipation is required. SmoothFlex™ is an excellent choice for pharmaceuticals, food and beverage applications, the transfer of viscous media such as paints and adhesives, fluid transfer of corrosive chemicals, and high temperature hyraulic applications.